I enjoyed this book, and I have a caveat, which I’ll explain in a minute. The reason I felt drawn to purchase this book was because when I first picked it up I opened it right to a passage on ‘learned helplessness’. I’d heard this term before, referring to studies done by Dr. Martin Seligman, where he found that when dogs were prevented from escaping a box in which they were receiving shocks from electric grids on the floor, some dogs laid down, passively accepting their fate. When the same dogs were put in another box where escape was possible, they whined when they received shocks from the electric grids, but they did not try to escape. They had learned to feel helpless. In my own life, I found myself feeling helpless and powerless in certain types of situations. For quite some time I’ve been on a quest to re-claim my sense of personal power in these situations, without resorting to the force and ‘power over’ paradigm that is so prevalent in our culture. As I love to tell people when I’m sharing my enthusiasm for Marshall Rosenberg’s Nonviolent Communication model, my biggest ‘aha!’ the first time I read Marshall’s book was that I was keeping myself in victim consciousness by the way I was labeling my feelings. Learning to re-frame my feelings as internal states (‘I feel hurt / sad / frustrated’) rather than interpretations of what was happening to me (‘I feel invalidated / manipulated / controlled’), quite literally changed my feelings, my relationships, and my life. I’ve since worked with other transformational communication books and models, and I enjoy incorporating what I learn into my personal life as well as into my teaching and working with others. 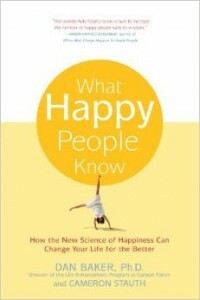 I was intrigued by the little I read of “What Happy People Know” in the bookstore, and I brought the book home. I was not disappointed. I found the book to be compatible with and building on many skills I have been developing over the past several years. In the first chapter, we are introduced to the notion that our biological predisposition is to FEAR and SURVIVAL, and this biological circuitry is our greatest enemy of happiness. We then learn about 12 qualities of happiness (such as optimism and perspective), 6 happiness tools (such as appreciation and choice), and 5 happiness traps (such as trying to find happiness through pleasure, and trying to be happy by resolving the past). The author gives very specific, practical strategies for connecting with and focusing on what’s important to us, and on our strengths and values, rather than focusing on fear-based problem solving. Using a model called ‘Appreciative Inquiry’, developed by David Cooperrider and Diana Whitney, we learn to ask constructive questions to support the process of change. For example, rather than asking and focusing on “what’s wrong?” and trying to change by overcoming weakness (one of the 5 happiness traps), we ask “What’s worked for you in the past?” to connect with strengths and creativity. Back to our example of ‘learned helplessness’, it may be no surprise to many of us that a perceived lack of choice can be a powerful trigger for helplessness. When we were children, many of us experienced situations where, like the dogs in the Seligman experiments, we reacted to situations by learning helplessness. As the author says, “Learned helplessness can overtake almost anyone, but it most often occurs in three basic situations: When someone fails too many times, when someone is boxed in by a double-bind, lose-lose situation, or when someone is dominated by somebody else who takes away his opportunity to choose.” He further states “When this cycle of helplessness takes over the mind, it contributes to three primary errors of perception. It creates 1. Permanence – thinking that a problem will last forever, 2. Personalization – thinking that every problem is your fault, and 3. Pervasiveness – thinking that one problem extends to every other situation.” Thus, while we may not like the choices we perceive, we may be contributing to our sense of helplessness based on our perception. We can regain some sense of choice, and some sense of personal freedom, by working with and changing our perception. This book presents several practical strategies for reframing our perception and regaining our sense of choice, which is a very necessary ingredient for happiness. I enjoyed the first part of this book immensely, and I found the concepts supported me in deepening and clarifying many skills and strategies I am already familiar with. I started becoming irritated with the author in Chapter 6, however, when I found him to be presenting his interpretations as the truth. I also found myself getting a little stuck in attempting to apply some of the strategies in an ongoing situation that has been quite challenging for me. I fell into my old pattern of attempting to move through a challenging situation by trying to talk myself out of the feelings I wasn’t enjoying. I find I can create a power struggle within myself by the way I try to empower myself sometimes. (Anyone else ever have that experience?) Fortunately, in this case, I had a dream that reminded me that I needed to sit and be with what I was experiencing before I tried to change it, and indeed, I released the power struggle and came back to a place of compassion and acceptance. Self-empowerment through compassion and acceptance, what a concept! So my bottom line recommendation on this book is that there are many very useful tools and concepts, and let’s not forget to balance with the doing with the being.